When it comes to Google Ads’ search ads, a lot has changed in the past couple of years. Remember the standard text ads? Sounds like ages ago, right? Expanded text ads came around in 2016, and now Google is upping their game once again by launching expanded text ads on steroids, that allows you to increase your real estate on the search page even more than the previous one. How do these new changes work? This all adds up to having an additional 130 characters to convince your potential customers to click on your ad instead of your competitor’s. The first two headlines are required, while the third one is optional. Please note that the third headline and second description won’t always show. It will depend on the size of your potential customers’ screen. The wider the screen on mobile devices, the higher the chance that your third headline will show. This is important because you cannot rely on it. Some users won’t see it, and you’ll need to make sure your message is conveyed without it. Google hasn’t rolled out any communication about the phase-out of the “old” expanded text ads. They will continue on serving. Expanded text ads tend to have a higher click-through-rate in comparison to the standard text ads. With these new expanded text ads on steroids, you could possibly increase your CTR even more by providing more enticing content in your ad copy. Who doesn’t like for their ads to be bigger and take up more space to push your competitor’s down the Google Search Engine Result page? You can now make this happen before your competitors start picking up on it. The additional third headline and second description line is the perfect opportunity to start working on those keywords with low-quality scores to make good use of the additional space that Google is offering. Did we get you excited about this new feature? Don’t get too excited and pause all your previous ads. Instead, A/B split test these new expanded text ads with the previous format to compare the performance. Just because it’s new, that doesn’t mean it will give you the desired results from the get-go. Once the performance of your expanded text ads on steroids is better than the old version, then go ahead and pause them. Taking into account that the second description line and third headline won’t always show, especially on smaller screens, you will need to make sure that when writing your ad copy your first two headlines and first description line contain the most important information and unique selling points. The ad copy has to make sense even without showing the third headline and second description line. It’s a poor practice to just copy your current ads and add an additional headline and description line. Get creative! Simply adding information to your existing ad doesn’t automatically make your ad more enticing to click on. Instead, take this as an opportunity to do some research on your competition and make your business stand out with YOUR unique selling points. Just updating your expanded text ads won’t get you there. You will need to review and adjust your ad extensions to avoid duplications and redundancy of promotions and unique selling points in your ad copy and your ad extensions. Note that Google will not serve your ad extensions if the content is a duplicate of your ad copy. Since the search behavior on mobile devices is different from desktop, you will need to write a tailored ad copy that speaks to these 2 different audiences. 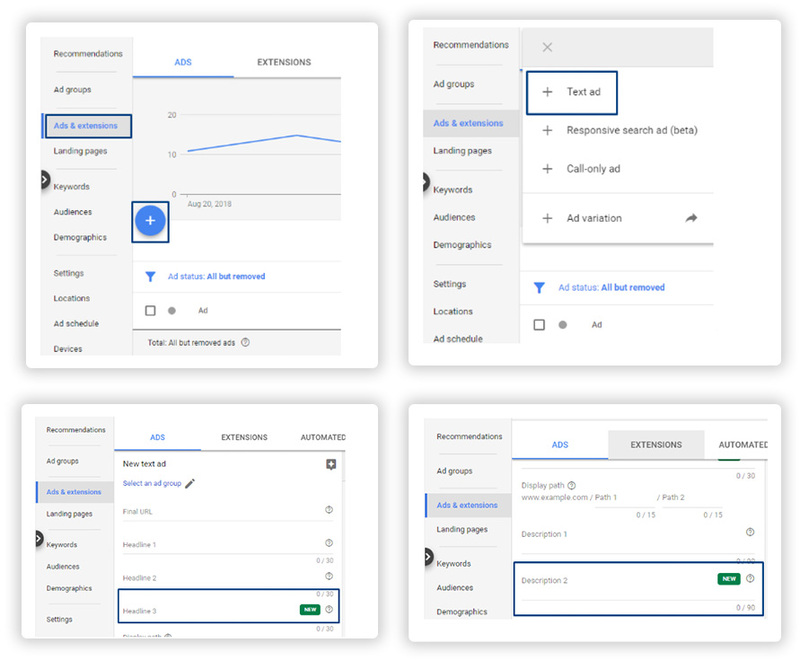 Even though Google does not have the checkbox anymore to serve a mobile-preferred ad, they still have the option to create a different ad message for mobile devices by using the IF function. Make sure your message and call-to-action are enticing for the different devices. We are excited and so should you be! 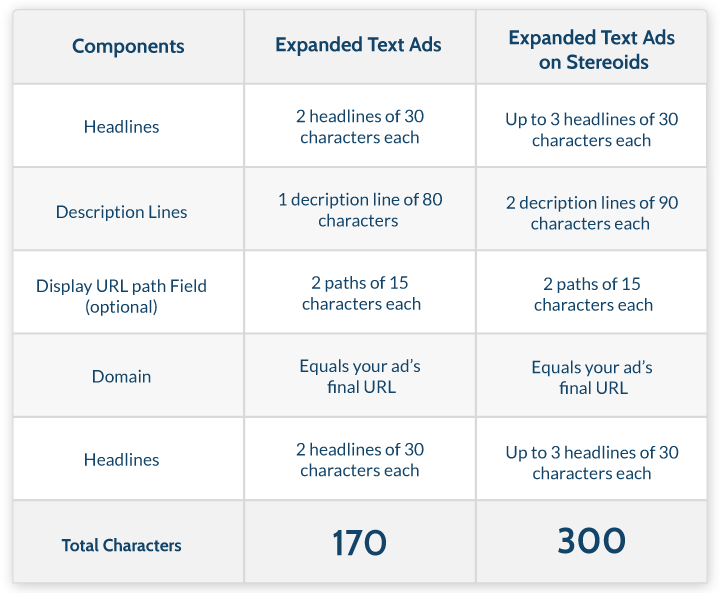 Take advantage of these new expanded text ads on steroids and get ahead of the competition. Genevieve is Director of Client Experience at White Shark Media. She has a background in physical education and teaching. 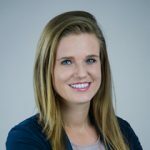 Four years ago, she switched to the Digital Marketing Industry and is in charge of managing client relationships and seeking opportunities to grow their businesses through Google Ads and Bing Ads.